The Dogwoods really can look quite spectacular in the right light at this time of year on sunnier patches of Mayfields, as Pam’s seasonal photo below shows well. The more observant passing through the gate at Nelsons Lane may have noticed a small Yew tree beside the main gate (caught on camera below by Pam). This is a self-sown seedling transplanted there almost a year ago now. 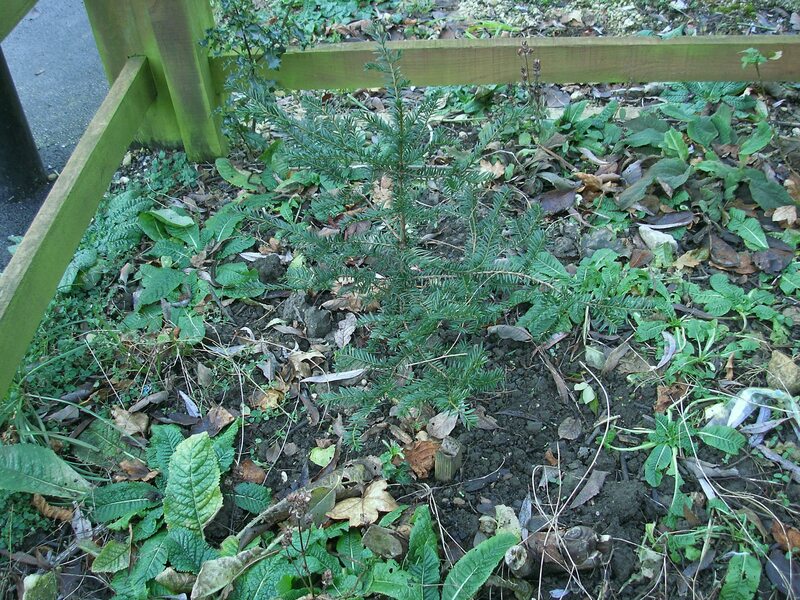 Yew is native, evergreen and slow growing, making it very suitable for that particular spot. 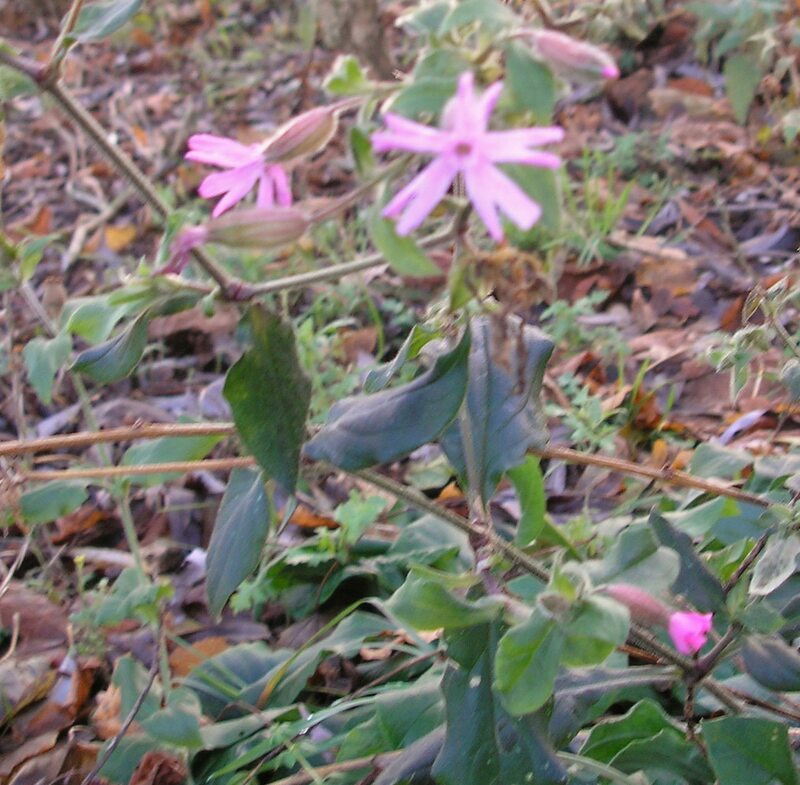 We weren’t sure we’d find a wild flower of the month for December, but the tough little Red Campion just to the west of the gate was still blooming on December 12th under the shelter of the trees. 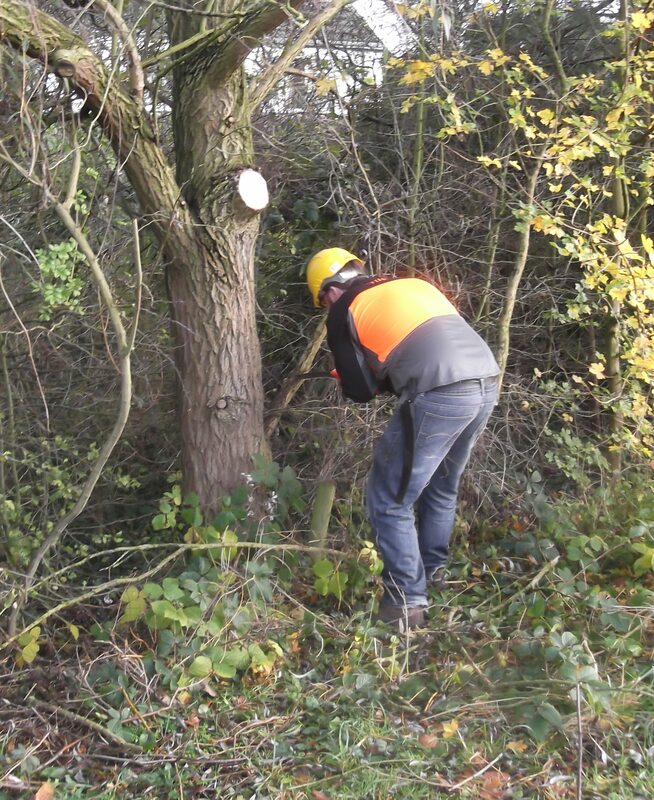 Malcolm , Mike and Dave were grateful to John Wood for help with trimming back a grey willow on the first Wednesday afternoon session in December. The tree in question had been planted right up against the boundary fence and was causing serious problems to the adjacent garden. MCT is always happy to discuss issues like this with adjacent property owners. 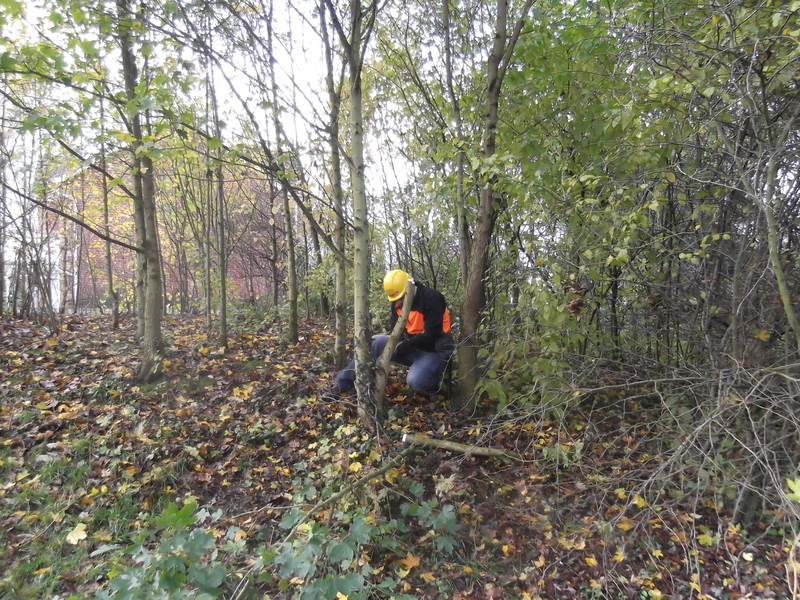 The height has since been further reduced in small steps to avoid damage to the two adjacent fences to help with future management. 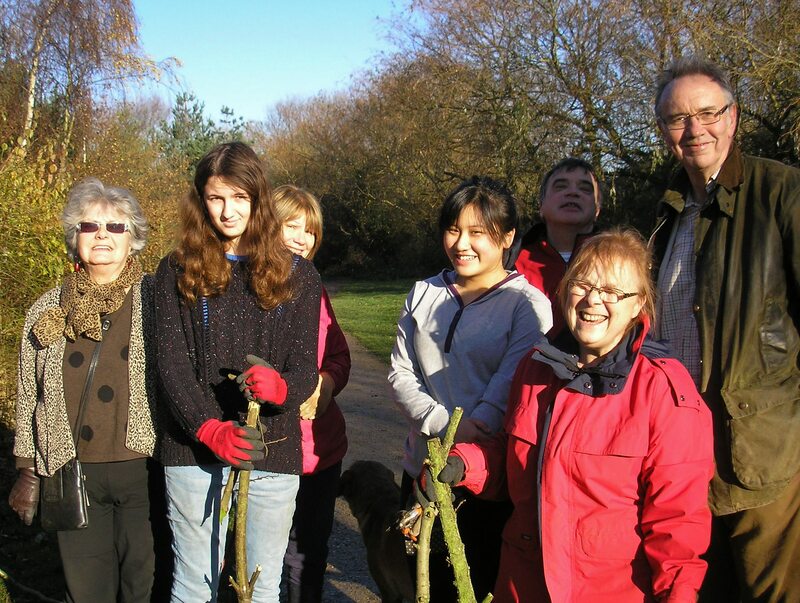 Our 8 MCT volunteers were blessed with glorious sunshine at 10 in the morning on the last Sunday of November, which made trimming some of the excessive growth of hazels and dogwoods and some dead rose branches beside the path an absolute pleasure at our last formal Sunday volunteer session of 2014. Work over the rest of the year will continue on an informal basis though. Thanks to Pam for the photo. Dull and moist days in late November can be perfect for transplanting trees. 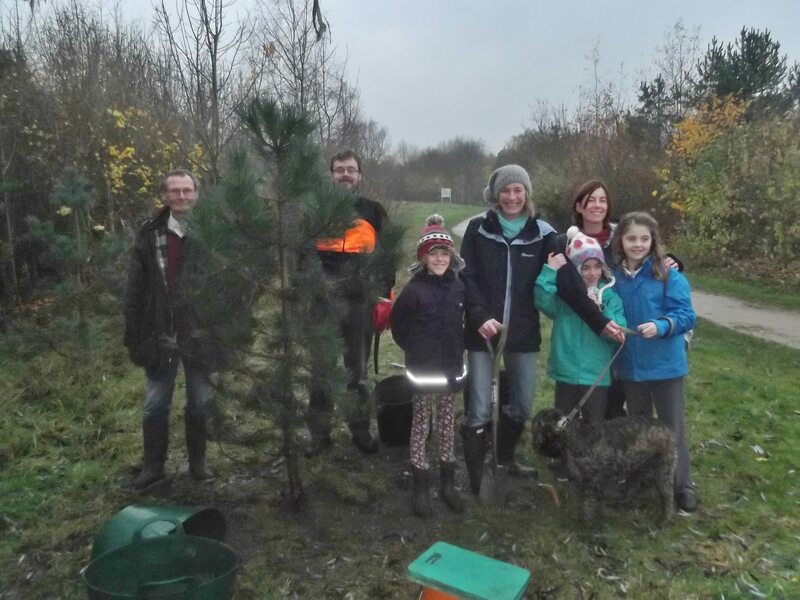 The inclement weather did nothing to mar the pleasure of the group below who had just added an attractive pine to the Mayfields site. The tree, which had outgrown its container, had been much loved since it was first seen as a tiny seedling more than a decade ago. One of the many joys of working on Mayfields is that you never know quite what you will find hidden away in the meadow and woodland. 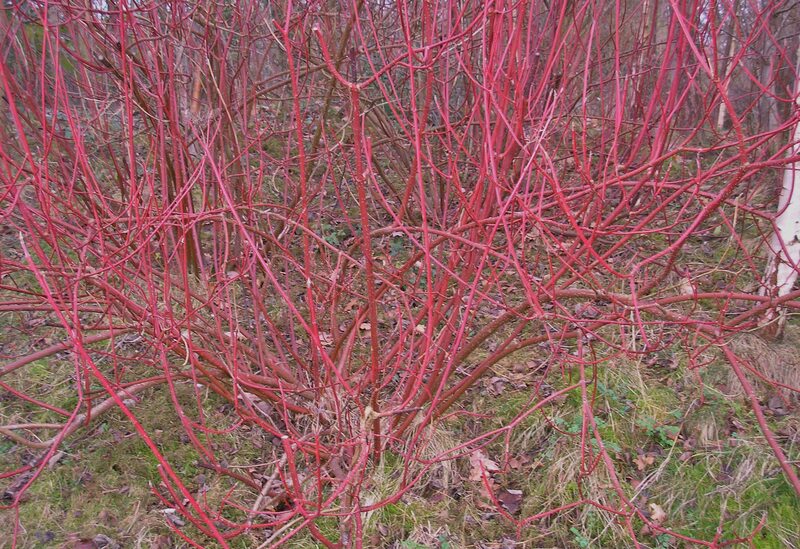 A shoot on one fascinating self-sown small tree that has made an appearance is shown below. 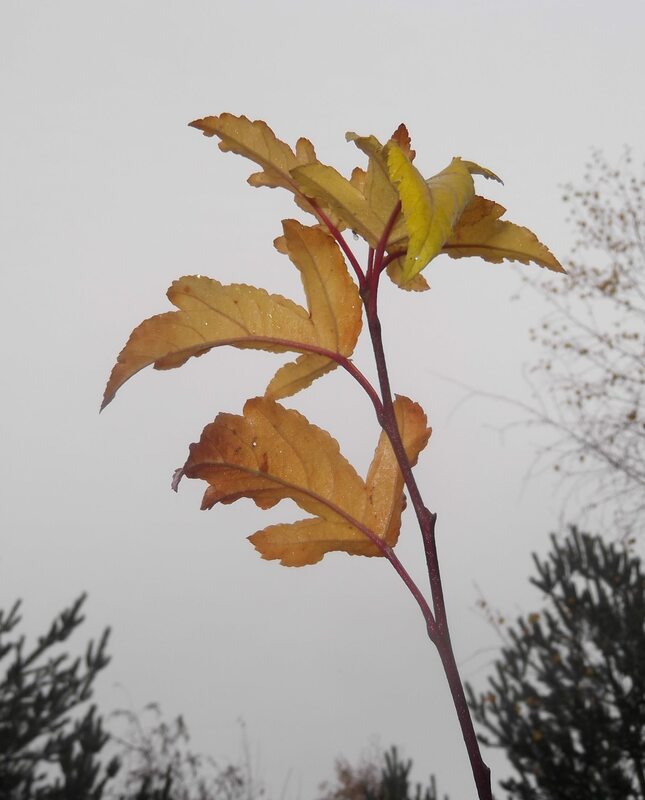 It’s not easy to identify with just a few lemon-yellow leaves left but the tree i.d. experts at Askham Bryan think it’s probably Malus Toringo, or Siebald’s Crab. Although it’s not a native species, we feel an isolated specimen will add to the beauty, interest and educational value of the area. 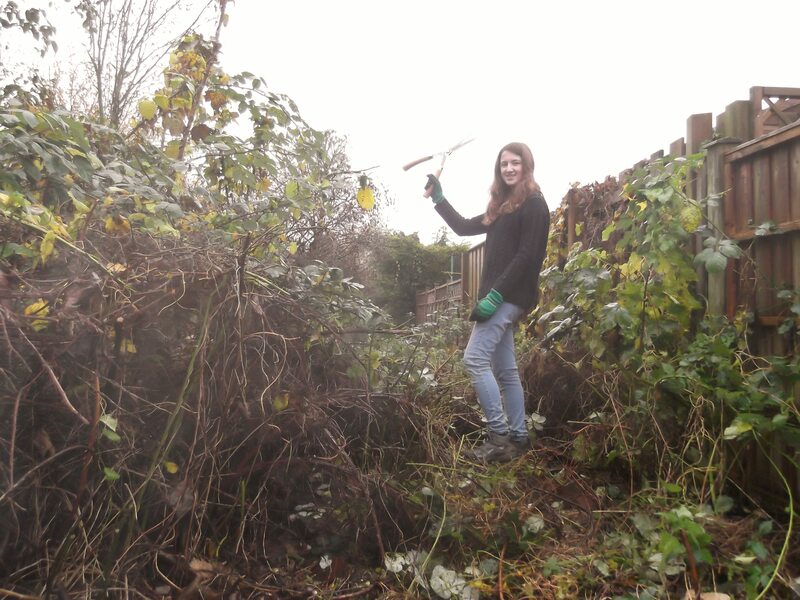 Undeterred by light rain, Charlotte renewed her attack on the overgrown path (as in photo below left) at our Sunday morning volunteer session. Her enjoyment when she finally broke through was clear for all to see (below right). 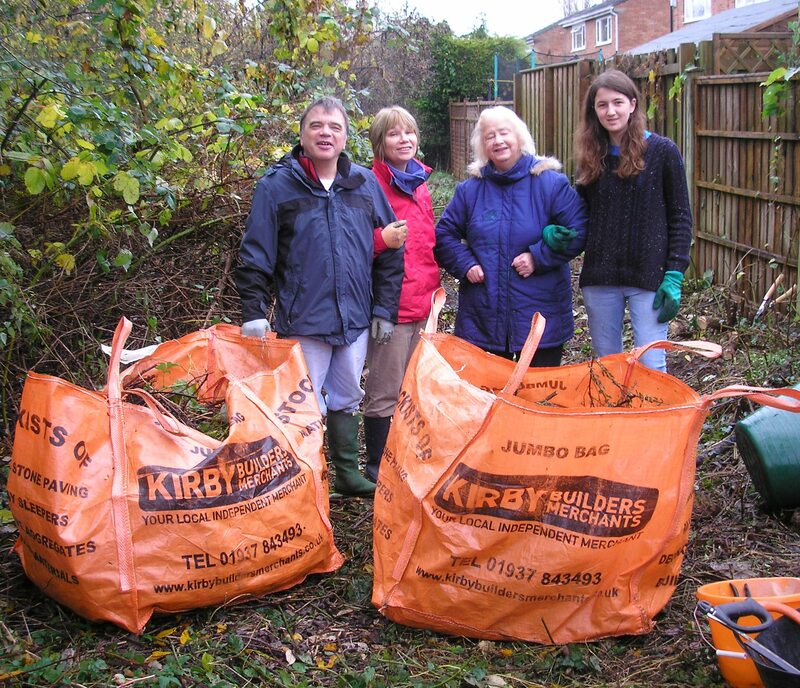 For once we managed to persuade Pam to go in front of the camera briefly for a celebratory photo before Paul and Lesley transported the off-cut material to the compost heap at the other end of the site (Pam takes most of the photos we put on the web site). 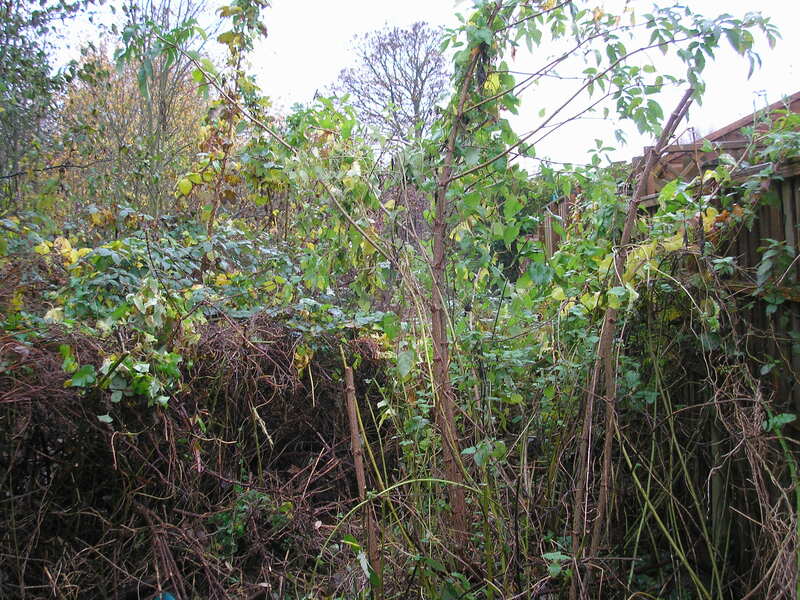 After an hour of composting Wednesday’s trimmings from willows and a maple, Charlotte and Janet attacked the brambles and nettles behind the east bund like a couple of intrepid jungle explorers! The five other volunteers at our 2-h Sunday volunteer session on September 16th cut up the material they removed ready for composting. Weather permitting, we hope to join the two ends of the pathway behind the bund next Sunday, as in the management plan. Mid November is a good time for improving tree architecture and/or making space for overcrowded more desirable trees. 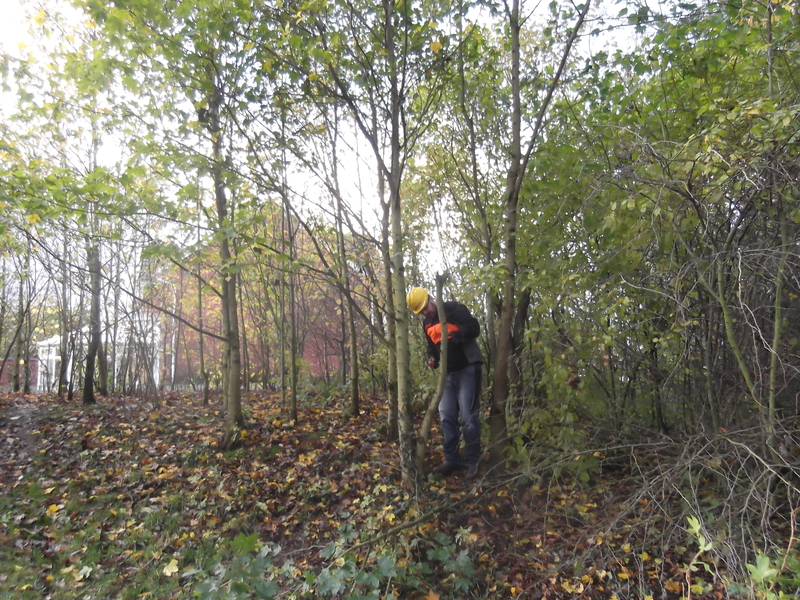 The photos below show the first 3 stages of 4-stage removal of a field maple side growth on the west bund by Dave Moore. 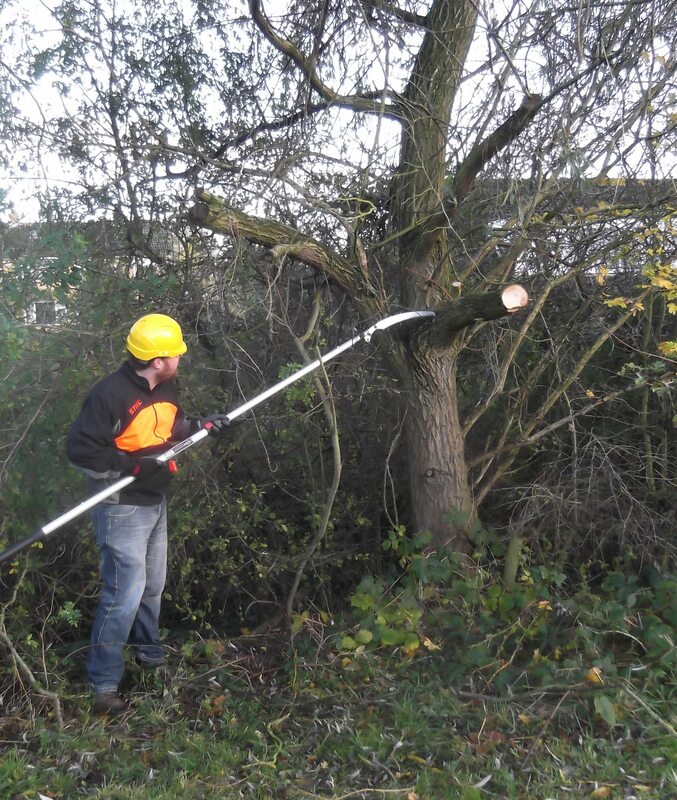 Dave and Malcolm, the field work co-ordinator, have also been improving the crack willows east of the path to improve light levels and tree shape, to reduce litter-fall onto the path next year and to improve growth conditions for some other tree species. 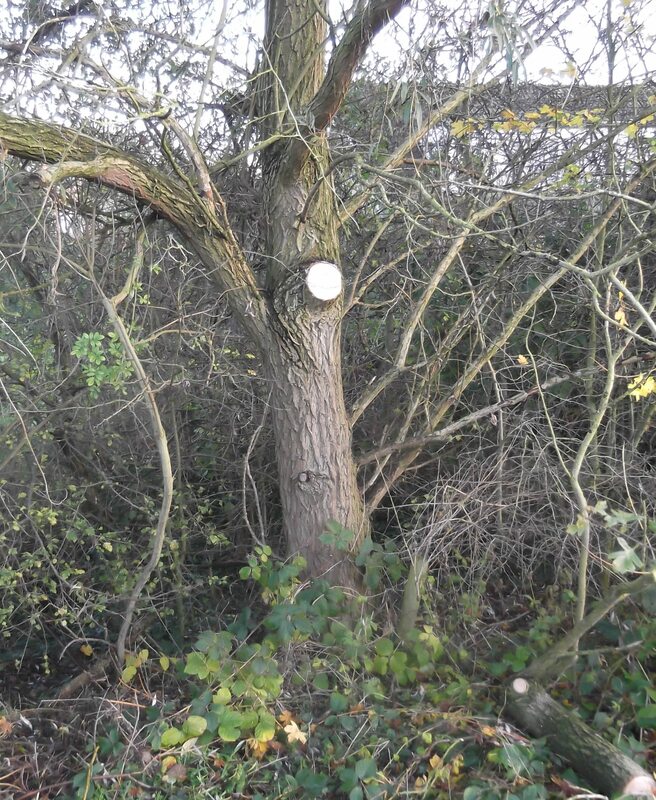 A significant amount of dead wood was removed as lower branches. It finally stopped raining at 4 O’clock on Saturday 8th November, so we were able to put a couple of posters for you all to look at in our newly installed information board. We hope you’ll like them. 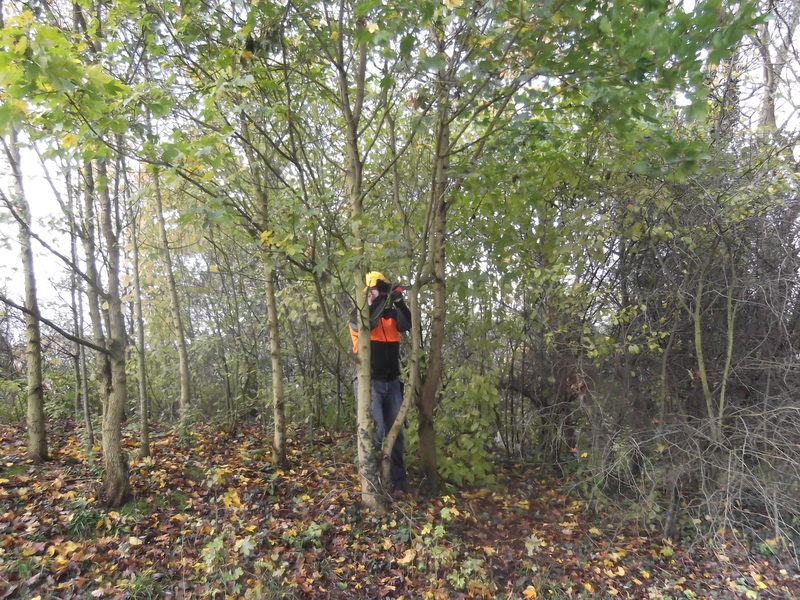 We plan to alternate the poster by Dave Moore on tree identification at Mayfields with one on Wild Flowers photographed on the site over the past year. 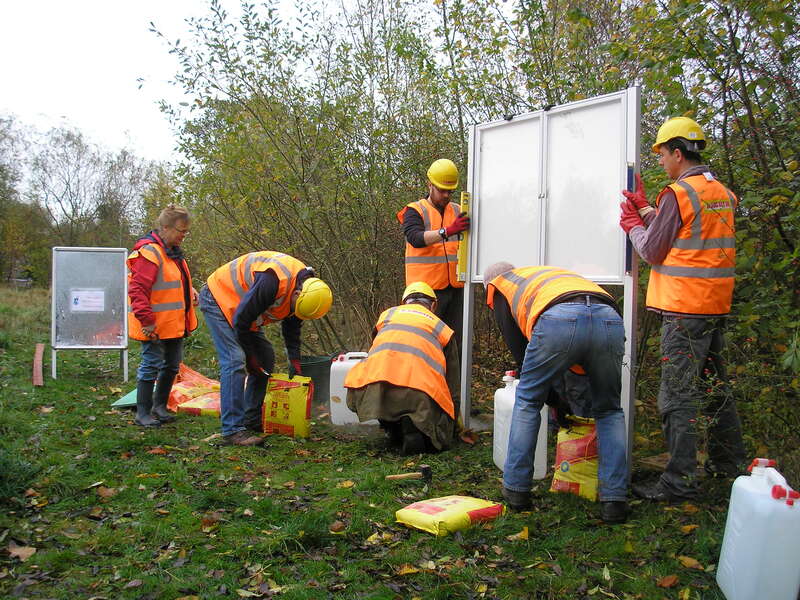 MCT greatly appreciates any help it receives towards funding its work on Mayfields. 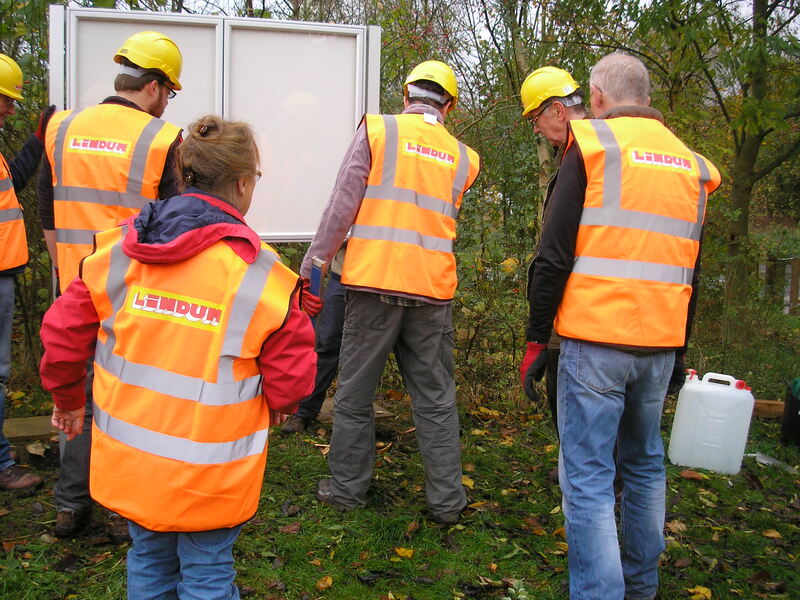 Early in November we received a very valuable contribution from Lindum in York, in the form of extra hard hats, high visibility vests and high quality safety gloves. These are all very important as we take safety very seriously. 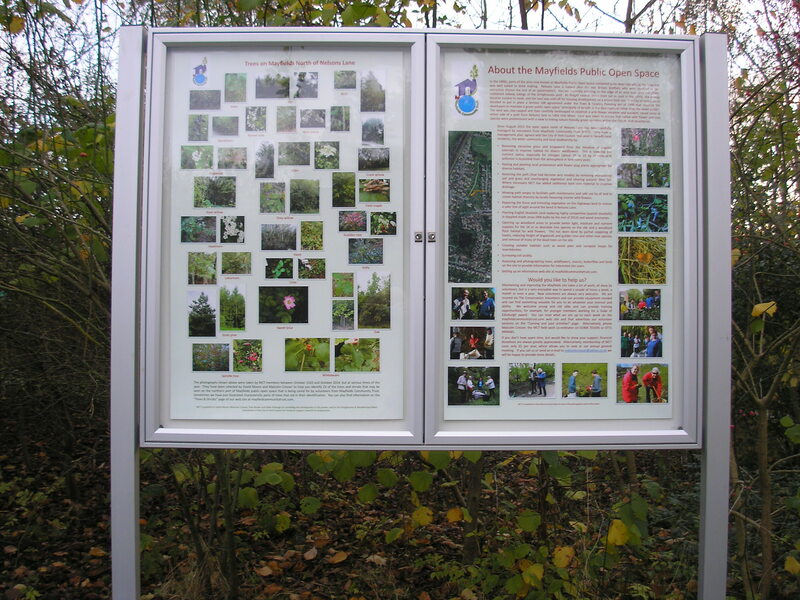 As Pam Brown’s photos show, they were put to good use when we erected the first of our information boards. 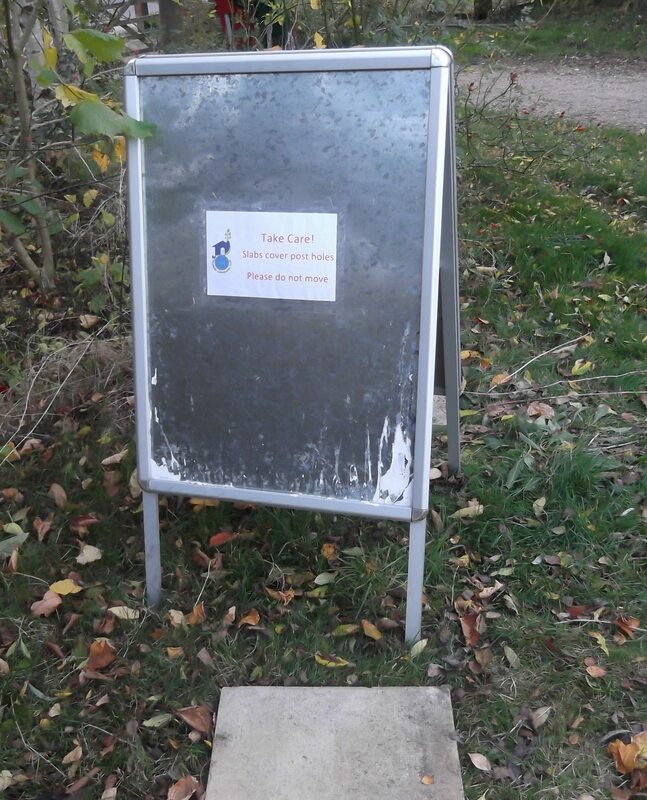 Over the first week in November some of you may have noticed a safety sign board just inside the gate (as shown below). This was a warning sign about paving slabs covering post holes prepared for installation of the first of 2 site information boards. A preview of typical posters for the boards was displayed on Thursday 6th November at the CYC Community Conversation Meeting from 6 to 8 p.m. at Woodthorpe Primary School in Summerfield Road, York. 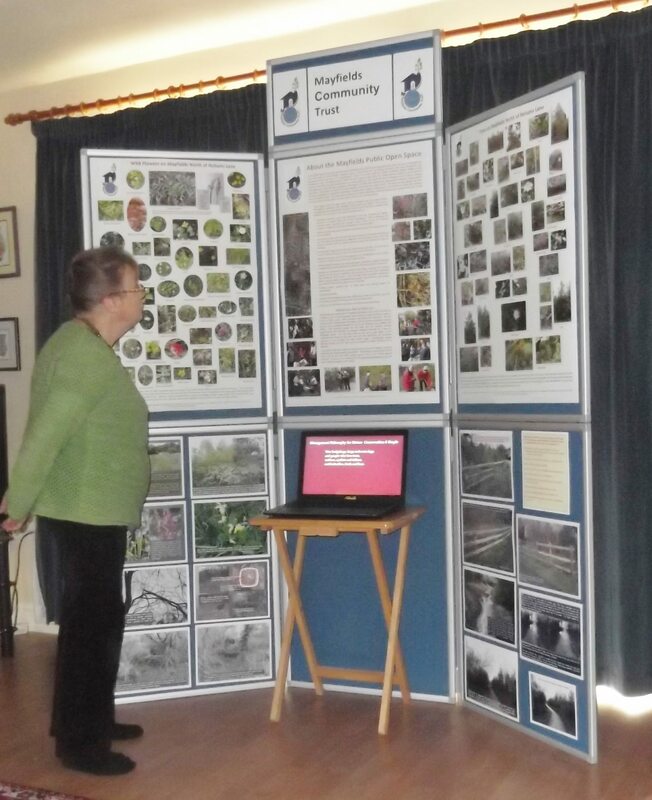 Louise, the MCT secretary, can be seen below admiring the new display. Our new board system (purchased from Panel Warehouse via the internet) worked very well for us. 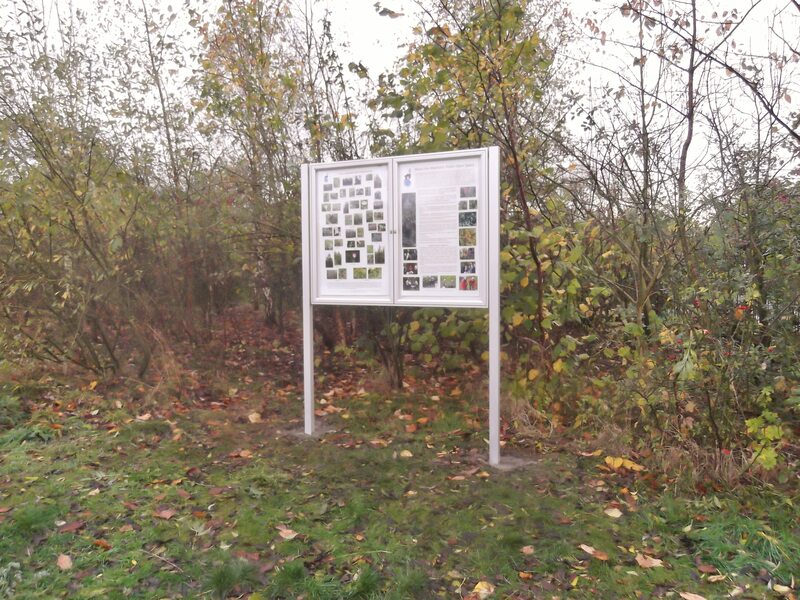 MCT is very appreciative of the financial support it received from the Dringhouses and Woodthorpe Ward Committee towards costs of erection of educational information boards on the Mayfields site and for our internal display boards. On the first of November we were anticipating a bit of a challenge in finding a new wild-flower of the month. 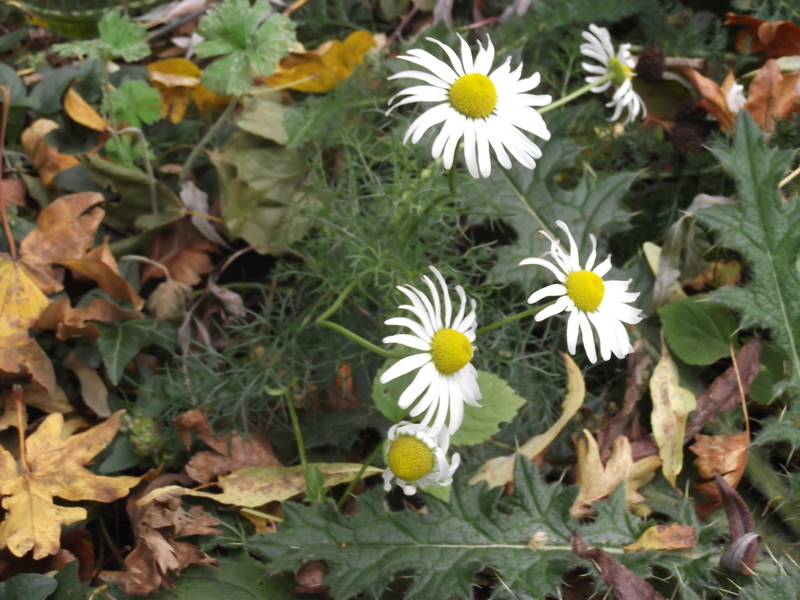 However, nature didn’t let us down and we found a very pretty Mayweed in full bloom west of the path near the gate. It is common in many places, though not usually on calcareous soils and can flower through to November. Our other challenge has been gathering fallen leaves and twigs from the path near Little Hob Moor before they turn to humus and then mud. Of late we have been using our 36-volt MacAllister rotary mowers as leaf shredding and gathering “hoovers” which is not too noisy and saves a lot of time.